"In Turin on 3rd January, 1889, Friedrich Nietzsche steps out of the doorway of number six, Via Carlo Albert. Not far from him, the driver of a hansom cab is having trouble with a stubborn horse. Despite all his urging, the horse refuses to move, whereupon the driver loses his patience and takes his whip to it. Nietzsche comes up to the throng and puts an end to the brutal scene, throwing his arms around the horse’s neck, sobbing. His landlord takes him home, he lies motionless and silent for two days on a divan until he mutters the obligatory last words, and lives for another ten years, silent and demented, cared for by his mother and sisters. We do not know what happened to the horse." So begins Béla Tarr's The Turin Horse, a grim, utterly mesmerizing film purported to be the director's last. These words, read over a black screen by an unseen narrator, set the stage for the film to come. This fateful encounter with Nietzsche is the catalyst for the sparse and austere narrative to follow, which reveals itself slowly and carefully in a way that only Tarr can do. Erika Bók (Ohlsdorfer's daughter) in "The Turin Horse." The film picks up immediately after the meeting with Nietzsche, and centers around the owners of the horse on which the famed philosopher met his end. These two peasants live out a meager existence, trudging through their daily routine - cooking potatoes, gathering water from the well, going to bed. It is a monotonous, never ending cycle, only broken up by the occasion visit by marauding gypsies or the ever increasing refusal of the horse to do anything. Much like Nietzsche, the horse seems to have slipped into a deep depression from which there is no escape. On the outside, a seemingly neverending gale rages on, whipping up dust and leaves around the house as if its occupants are caught in some kind of vortex out of time. The end is approaching, and their lives have been fundamentally altered in ways they could not possibly imagine. Tarr shoots with long, languid takes that often linger minutes longer than you feel like they should. But the effect is intoxicating. Never has the simple act of cooking potatoes been so wholly entrancing. Tarr takes these seemingly commonplace acts and turns them into a kind of poetry of the mundane. There is little dialogue in the film. Tarr simply allows the camera to observe, unblinking, sometimes for minutes on end, often accompanied by composer Mihaly Vig's haunting, Phillip Glass-like score. He immerses us in these people's lives, and their impending doom, creating both an atmosphere of apprehension and mystery. What does the future hold? What lies beyond the windswept plains? Are they all alone in this blustery world? Or are they hurtling toward an inevitable, inescapable fate? Mihály Kormos (Bernhard) in "The Turin Horse." Those who are familiar with Tarr's previous work probably know what to expect from The Turin Horse. It will be an admittedly tough slog for a vast majority of audiences, but for those with the patience, the rewards are boundless. The Turin Horse feels like a profound literary work, which is ironic since there is hardly a word spoken for its entire running time. Tarr's work has always begged comparisons to Andrei Tarkovsky, but never has the comparison felt as apt as it does here. It recalls Tarkovsky's apocalyptic The Sacrifice in its evocation of impending doom as an avenue for deeper, existential questions. But don't expect the answers to reveal themselves easily. With little dialogue to help the audience along, Tarr demands more of his audience than most directors. It is a film that must be mulled over, meditated upon, and combed through. It requires mental participation to truly appreciate, which is perhaps one of its greatest achievements. This is a film for the heart and the mind, a film of feelings and ideas. The Turin Horse is certainly no walk it the park, but it isn't meant to be. And as Tarr's final film, it's a staggering statement by an auteur working at the height of his powers. It's at once elegiac and fiercely relevant. Tarr is not content to go quietly into that good night. He has made a triumphant film that, if it truly does turn out to be his swansong, will be long remembered by cinephiles as one of the great final works by a director who refused to fade away quietly. While it is regrettable that we will see no more films from the Hungarian master, he has left us with a cinematic feast that should keep fans and newcomers alike talking and debating for years to come. 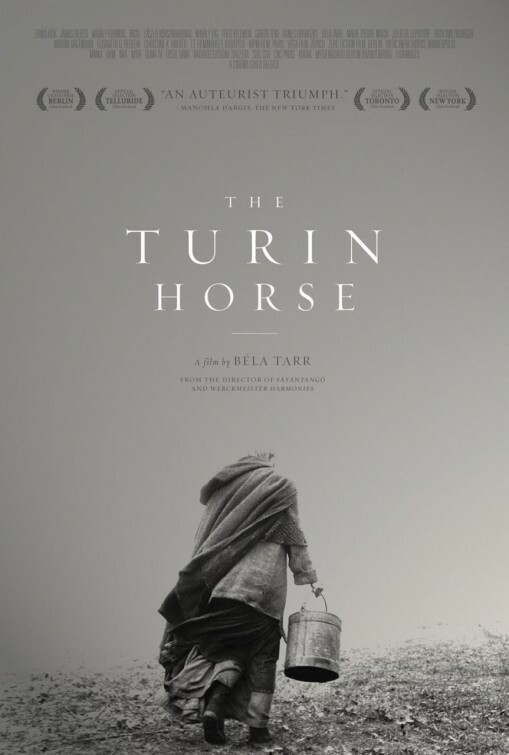 THE TURIN HORSE | Directed by Béla Tarr | Stars Janos Derzsi, Erika Bok, Mihaly Kormos | Not rated | In Hungarian with English subtitles | Opens today, February 10, in select theaters.